Roguelikes are hard to get right, but brilliantly addictive when handled well. Rogue Legacy is still one of my favorite games (and I still need to go back and get that “no more than five deaths” trophy! ), as it allowed the player to grow steadily, not only through learning room layouts and enemy attack patterns, but also in the steady upgrades you could give your characters before each new run. The best part of roguelikes is coming away from them feeling like you’ve become a better player. 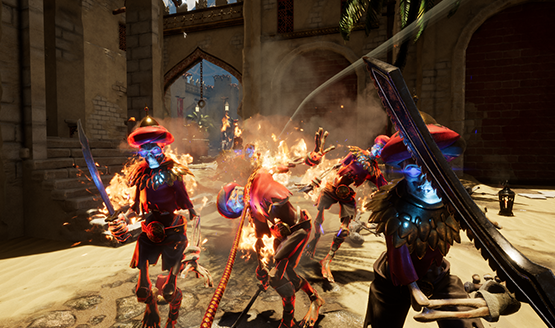 City of Brass starts to scratch the itch for a first-person roguelike, but encounters a few pitfalls along the way. A randomly-generated city lies before you, a maze of pathways made up of preset rooms that change each and every time you play. Die and you are sent back to the beginning. Find the gate to the end of the area, and you’ll head onto the next level. There are 12 levels in total, along with four boss characters. Once you beat a boss, you can jump forward through portals to that area without needing to replay the entire game, but there’s always a cost. Each portal takes one wish, of which the player has three. Skipping to the end would use up all three wishes, which are also good for re-rolling what a genie has for sale and making evil genies stop raining fiery destruction down on your head. City of Brass doesn’t have much of a story to drive you through to the end. When you play the tutorial, there are some minor story bits that pop up in the form of text boxes in front of ghosts. Basically you need to get to the center of this lost city to remove an evil genie’s curse. Outside of that, don’t expect much narrative development about who you are or what your motivation for putting yourself in so much danger is. Each time you start anew, it’s referred to as an heir. My assumption, then, is that this is a tragic family line. Children grow up without parents. They have children of their own, and then immediately head off to be embarrassingly felled in the outskirts of the lost city by a charging corpse with no arms. With my own head canon firmly in place, I set off again and again, dying enough times that I was surprised I hadn’t developed future tech to combat the undead with. Must be part of that genie curse. As you explore the randomly generated and twisting paths of the city, you’ll pick up treasures which allow you to by equipment from genies that can be found scattered around each level area. Feel free to spend, because you can’t take it with you when you die. Barring the insurance buff you can buy, each fresh start is a completely new beginning. The only progress to be made is getting some slightly better gear through leveling up, and learning the hard way about the traps, passageways, and enemies that lie scattered across the sands. Armed with a whip in one hand and a sword in the other, gameplay is pretty straightforward. The whip can be used to stun enemies, knock swords out of enemies hands, and even pick up far away objects. In the other hand, the sword does pretty much what you expect it to do as you cut through the walking husks of skin and bone that have been reanimated to keep you from the center of the city. Though the enemies themselves became more and more varied, I found myself using the same strategies on all of them. Whip them in the head to stun them. Bait them into traps. In order to make the game either easier or harder, there are blessings and burdens that you can bestow before the game. You could remove the timer if you just can’t make it through before the clock ticks down, or increase the number of enemies present if you’re a masochist looking for some punishment. Aside from a trophy that requires you to play through the entire game from the beginning with all burdens active, there’s no real incentive to not make the game as easy as possible. There’s not even a Platinum, so that extremely tough trophy is only in pursuit of a 100% list. The success of a roguelike is most easily determined by how much failure feels at the fault of the player. The game should never feel cheap, instead granting learning opportunities upon death. Roguelikes should level up the player’s mind, not their character, which is why the cheap deaths in City of Brass were often so aggravating to deal with. As much as I learned from replaying those opening few levels again and again–check the floor for traps, string out enemies one-by-one, use traps to your advantage–there were inevitable moments where I felt like death came in spite of my knowledge. In a side-scrolling game like Rogue Legacy, everything is presented for you to see. It’s not possible to get blindsided. More than once, City of Brass felled me with a charging no-armed corpse that seemingly came out of nowhere. I can be as cautious as I want to, working my way into a room at a turtle’s pace, and still I’ll have rotten meatbags suddenly appearing beside me, chipping away at my health. Of course there were plenty of deaths that were clearly my own fault (not checking for spike traps when entering a room, baiting too many enemies at once, etc. ), but those tended to highlight the moments when the game just felt like it was throwing cheap deaths my way. When death costs literally everything, unfair ones are harder to forgive. Part of this comes from the poor sound mixing. City of Brass wants to feel like a creepy living city, but when I can hear the raspy laughter of nearby corpses, my own grunts and foot falls, rattlesnakes, and all other manner of noises at nearly the same volume, it becomes very difficult to discern which sounds signal danger. I shouldn’t be able to hear enemies through walls as if they are right there in the room with me. My two options were to either be overly cautious at all moments, or let the knowledge that I can hear enemies through walls lull me into a false sense of security. Neither were an optimal choice. The sound design itself is great, but could really use a bit of landscaping to actually present threats from the distance and direction that they are in game. All that said, there’s a fun and entertaining game here. Despite its problems, I walked the scorching sands again and again until I reached the center of the city and completed the game (yes, I did end up using some blessings and portals to do it). 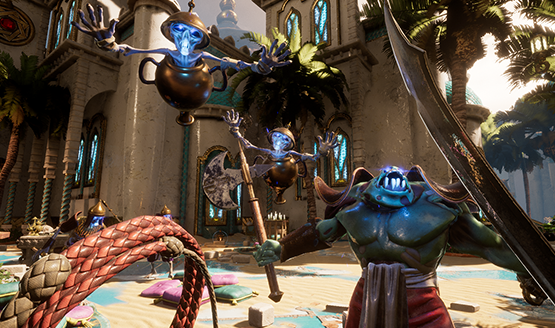 City of Brass is a really fun first-person roguelike, but the die-rinse-repeat formula wears thin far more quickly than it should. There’s simply not much more to do or see once you’ve played for a few hours or reached the end. Combat remains largely the same simple fare throughout, apart from intense boss encounters that account for a comparatively small portion of the game. 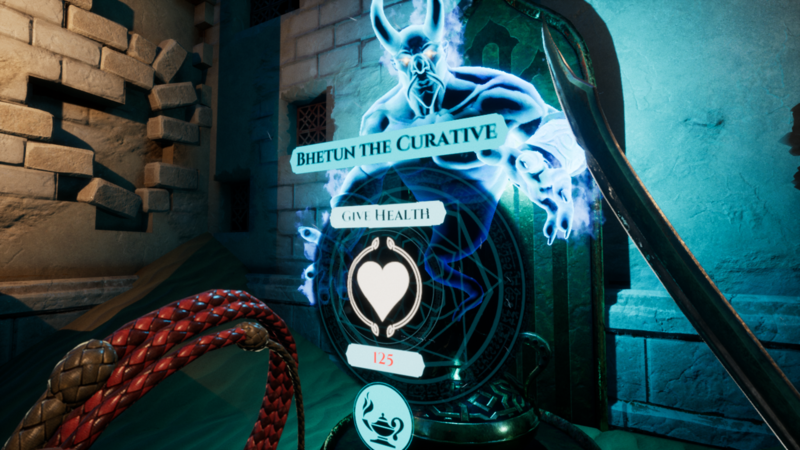 Upgrades earned over time and different ability setups through the genies offer the promise of varied gameplay, but City of Brass does little to entice the repetitive play that the genie’s curse asks of you. City of Brass review code provided by the developer. Version 1.01 reviewed on a standard PS4. For more information on scoring, please read our Review Policy.